Home to the great Mayan empire, Chichen Itza extends 6 square miles and includes several hundred magnificent buildings. You'll enjoy exploring this legendary wonder of the world, taking in the great pyramid of Kulkulcan, the temple of Venus, the temple of Warriors, the largest and best-preserved Mayan ballpark, tzompantli, and much more. Experience it all with the help of a tablet that brings to life everything you see with virtual and augmented reality technology. The perfect companion to your sightseeing, this tablet lets you see what the historic complex looked like centuries ago, as you view the ancient structures that remain today, including never-before-seen images of Kulkulcan, plus the temple’s interior tomb and statues. Watch Mayan warriors play ball, view the site as it once was and enjoy this close encounter with an intriguing civilization! • Chichen Itza: Visit the most impressive Mayan site on the Yucatan peninsula. • Lunch and Refreshments: Enjoy a boxed lunch and soft drinks, included in your tour. 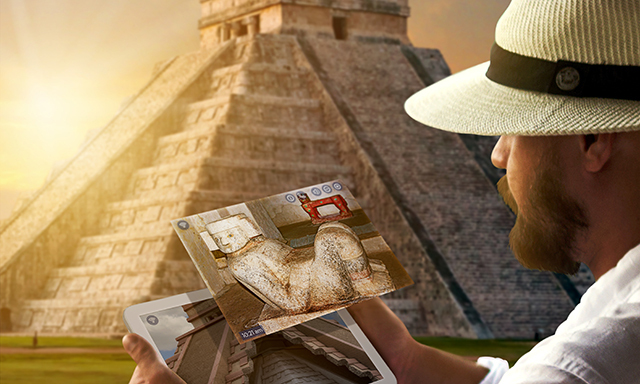 • Touring technology: An interactive tablet that offers both virtual and augmented reality enhancements of the Mayan ruins serves as the perfect sightseeing companion. • The tour duration includes approximately 6 hours of travel time. • The ferry to and from Playa del Carmen takes about 45 minutes each way. • The actual time at the site may be negatively affected by local traffic conditions and large crowds. • Guests are required to use headsets for a portion of the tour which are yours to keep. • For security and safety reasons, backpacks and large handbags are not permitted in to the Chichen Itza site. These items must stay on your bus, which will be secured by your driver. • Flash bulbs, tripods, and professional video equipment are prohibited at the ruins. Guests taking videos in any format (video cameras, cell phones, tablets, etc.) will be charged government fee of approximately $8-$10 USD payable in cash at site.